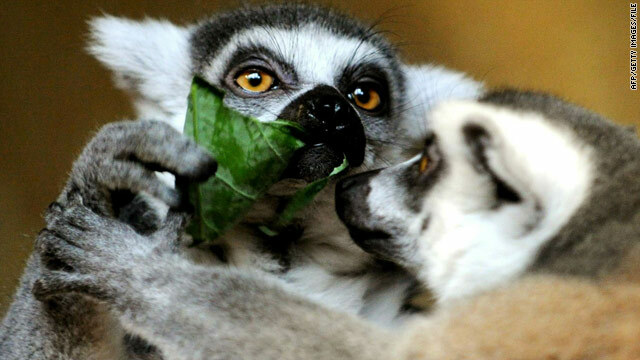 Ring-tailed lemurs are shown at Germany's Hagenbeck Zoo earlier this year. British billionaire Richard Branson plans to turn over one of his Caribbean islands to lemurs. Well, perhaps not the whole island, but Branson wants to establish a colony of the endangered primates on Moskito Island, one of two private isles he owns in the British Virgin Islands, according to news reports. Branson, whose Virgin group covers businesses from airlines to music to casinos, told the BBC last week that illegal logging in Madgascar, which he says has increased since a coup two years ago, threatens lemur populations on that island, the only place in the world the animals live in the wild. "We've been helping to try and preserve lemurs, and sadly in Madagascar because of the government being overthrown the space for lemurs is getting less and less," the BBC quoted him as saying. According to The BVI Beacon in the British Virgin Islands, Branson applied to bring the animals into the territory last October. The BBC reports Branson will be bringing 30 ring-tailed lemurs from zoos in Canada, Sweden and South Africa to the 125-acre island in a few weeks. The BVI Beacon said the animals will be kept in cages for up to a month and eventually released to roam the island. Other types of lemurs could follow if the program meets with success. Some scientists are questioning whether a species should be introduced into territory half a world away from its homeland. Biologist James Lazell, an experienced researcher in the Virgin Islands and president of the U.S.-based Conservation Agency, called Branson's plan a "terrible idea," saying the lemurs could damage the island's ecological balance, according to the Beacon. “They eat everything. They eat lizards. They eat fruits. They eats roots, insects, bird eggs, absolutely everything,” Lazell is quoted as saying. Penelope Bodry-Sanders, vice-chairman of the Lemur Conservation Foundation, told The Guardian, "the jury is out on this." "We don't know what pathogens the lemurs will bring to the Caribbean or what pathogens they will receive. It is great that Mr. Branson cares, and he has a history of acting responsibly, but we need more information," The Guardian quotes her as saying. The Lemur Conservation Foundation operates a lemur reserve in Manatee County, Florida. Branson told The Guardian that his experts said risks were small and local species would be protected if it became evident the lemurs were posing a threat. "We will have to play it by ear. If this works out well, we will bring in more lemur species and eventually hope to find a bigger island for them," the Guardian quotes him as saying. Now I will have a new land to conquer! Bow down before your new benevolent ruler! Bring me my dates Mort. Great that he is helping other people, but what about our low income seniors, mostly disabled, who live here in Jupiter, FL, who are being rezoned and/or the property is being sold?? Where do we go?? What can we do? Can't be buy the property and leave us in our homes? Some couples have been here for almost 40 years. I , myself, am disabled and on dialysis, and need to be close to my dialysis center. Can he please plead our case and/or plight?